Hundreds of angry investors have staged protests in the Bangladeshi capital, Dhaka, after the stock exchange saw its steepest ever fall in a day. Reports said they threw bricks at police, marched in the streets shouting slogans, and staged a sit-down protest. Shares in the stock exchange suffered large falls within hours of opening on Sunday as panicked investors went on a selling spree. The index ended the day down by 552 points or 6.72%. It has been on a rollercoaster ride in recent weeks, hitting a record high on 5 December, having climbed 80% since the start of the year. 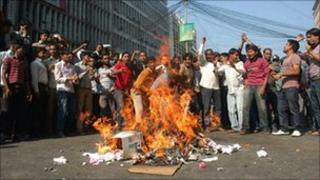 But on 8 December it nosedived, prompting protests in Dhaka and towns elsewhere. On Sunday, at least 500 investors hurled bricks at law enforcement officers near the Dhaka Stock Exchange and the Securities and Exchange Commission (SEC) offices, said local police chief Tofazzal Hossain according to AFP news agency. "They chanted slogans against the government and the regulators, and marched through the busy roads in the Motijheel Commercial area, halting traffic. They also staged a sit-in at the SEC building," he said. Analysts say Sunday's index fall was triggered by a central bank interest-rate hike. The regulators have also taken measures in recent weeks to restrict money supply into the share market after concerns that stocks were overvalued. The move forced big institutional investors to withdraw from the market, triggering panic among individual investors. The rising value of the stocks in recent years has attracted hundreds of thousands of small-scale or retail investors in Bangladesh, says the BBC's Anbarasan Ethirajan in Dhaka. It became a popular investment for ordinary people, often providing higher returns than bank deposits and savings. Regulators have now agreed to relax some of the conditions, hoping that will increase the money supply and stabilise the market, he says.